Colombia has made major economic and social advances in recent years. The combination of strong economic growth and policies targeted at the most vulnerable groups improved considerably the living standards of the Colombian population. Today, the country enjoys higher employment and labour force participation rates than the average of OECD countries and unemployment is steadily declining. Nevertheless, despite these positive trends, deep structural problems remain. Labour informality is widespread, the rate of self-employment is high and many employees have non-regular contracts. Income inequality is higher than in any OECD country and redistribution through taxes and benefits is almost negligible. In addition, half a century of internal conflict and violence has displaced a significant part of the population, and many of them are living in extreme poverty. Despite considerable progress, violence continues to be a challenge and also affects trade union members and leaders. The Colombian Government has undertaken important reforms in recent years to address these labour market and social challenges, and the efforts are gradually paying off. However, further progress is needed to enhance the quality of jobs and well-being for all. 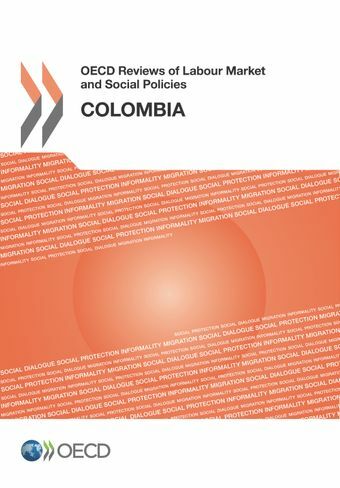 The main trust of this report is to support the Colombian Government in tackling labour market duality, generate trust between the social partners, develop inclusive and active social policies, and get the most out of international migration.